Remember the beautiful black Art Gift black tole tray I found for $4 at the consignment shop in August? I finally got it hung up! This shelf is in the front entry of my house. On the shelf is a vintage white figural swan planter with a hoya plant. 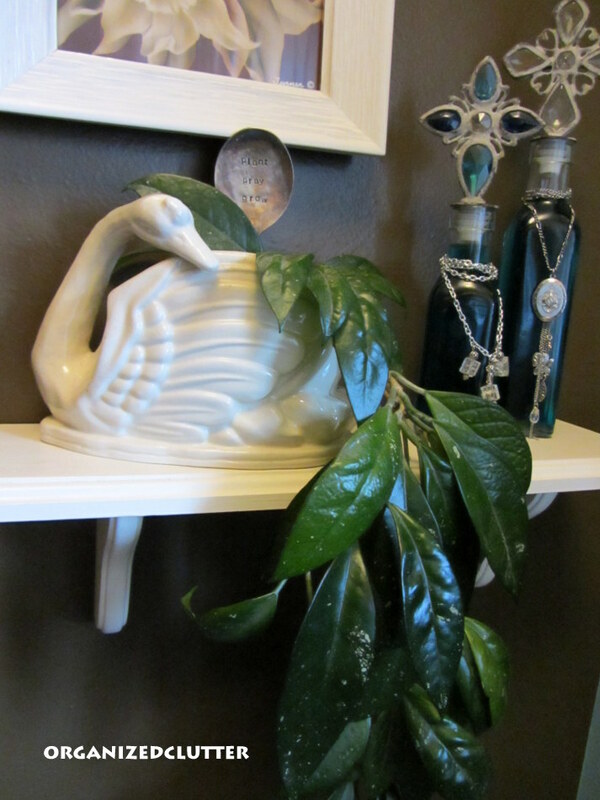 And, beside the swan planter are two clear glass bottles with decorative stoppers. They are filled with turquoise colored water. 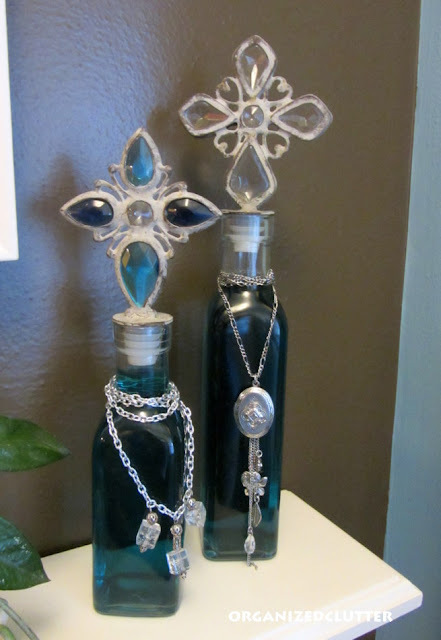 Consignment shop necklaces are wrapped around the bottle necks. A few years ago, I painted this dark brown accent wall directly across from the front door. The rest of the entry walls are turquoise, and the turquoise walls continue down the hall to the bedrooms. This whole brown/turquoise idea started with the purchase of a pillow in the same colors. This is just too dark for me, but I will have to wait it out a little longer before I change it, lest my husband blows a gasket! The title of this post says decorating an awkward space, and here it is. 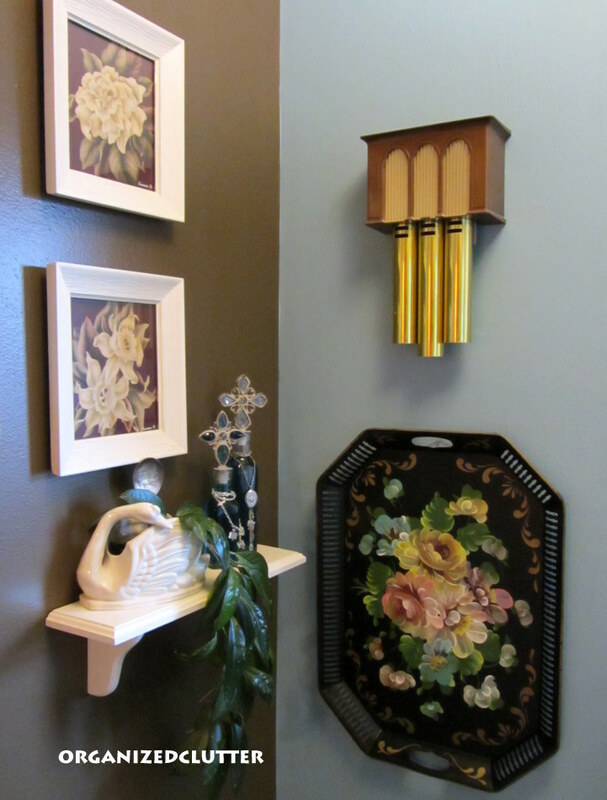 The brown accent wall meets a jut-out for a closet, where an ugly, vintage doorbell is hanging much too prominently. 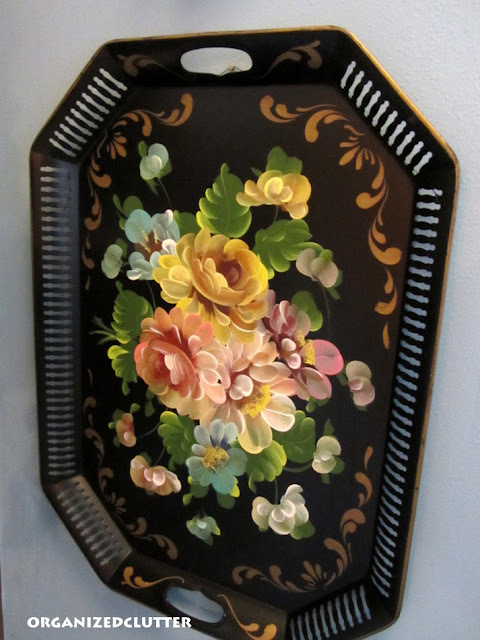 Hopefully, this beautiful tray will be the focal point of that wall and not the doorbell! You know Carlene, looking at that doorbell, if you put a decorative empty frame around it, it would actually look like a vintage piece of art. 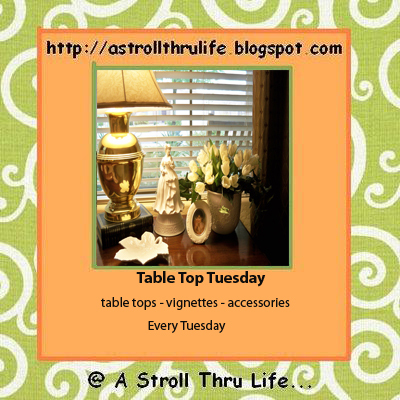 Love the tole tray!! The tray is perfect for that spot! And I actually like your brown wall. Love that tray and looks perfect there ... hard to notice the doorbell. I love your black tole tray. I've been looking all over for one (with no luck so far). The wall arrangement looks great. 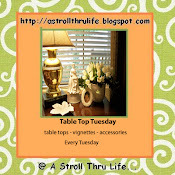 Carlene, Your tole tray is beautiful and what a steal! It looks great where you hung it. I think we all have places in our homes that we try to disguise or detract from. beautiful tray and what a deal! The door bell is just another reminder to me of days gone by and the one we had in our house growing up. It fits in! That is a lovely space, you got a great deal on the tray. I actually love the doorbell, as someone else said, it looks like a piece of art. I would not change it, paint it, or cover it, I would embrace it as an original part of the house. I think the space looks great. The to;e try really steals the show!